There must be hundreds of digital voltmeters around but anyway, here is one more. It's cheap and easy to make and I'm using it a power supply to display the adjustable voltage. 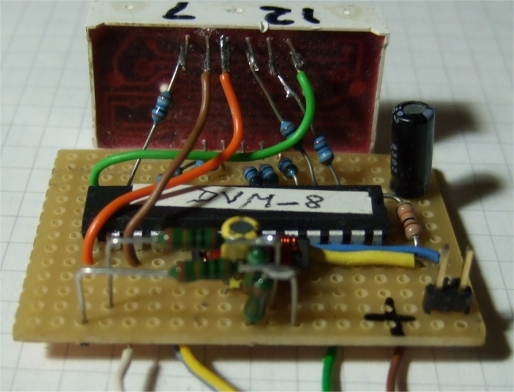 The little meter is quite versatile and relies heavily on the 10-bit ADC's in the ATMega48. 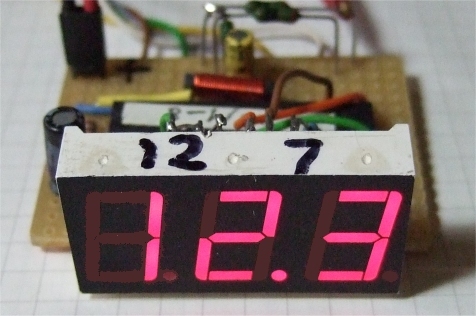 Two are used here and the voltmeter module can be switched to display the voltage on channel0 or the voltage on channel1 or the voltage difference of the two channels , a low on PC4/5 turns off the channel. 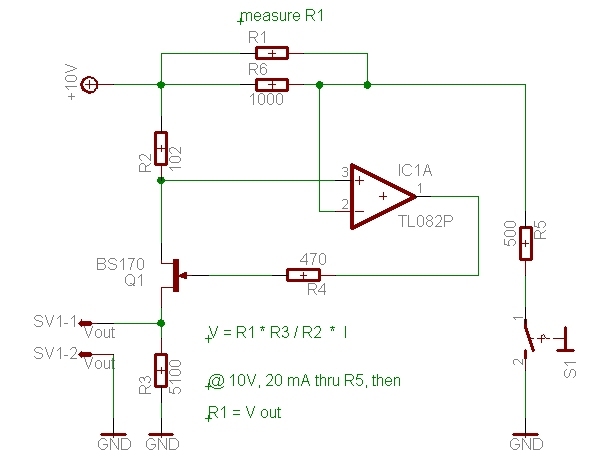 The idea was to measure the voltage drop across a resistor on the high side in a power supply to get the current displayed, it works but the resolution is not very good unless some amps are flowing. Displaying voltage is ok. The range is from 0 to 20 Volts but could be changed with a different resistor divider at the input. Here it is 100k / 5.1k. It needs a calibration with a reliable second voltmeter, then it can be quite accurate. 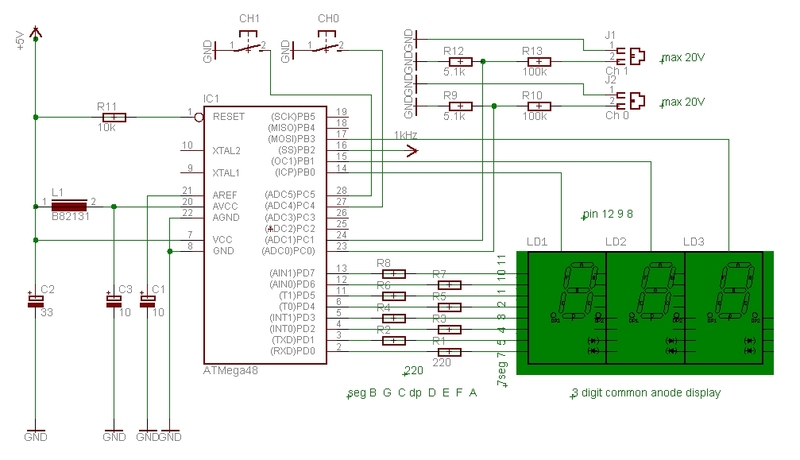 In the program you'll find Const Calfactor = 2140, this need to be adjusted even if you have the same resistor values by chance, they are never exactly the same and the internal reference voltage of the ATMega48 may also vary from chip to chip. Calibration is done by measuring a voltage with the module and a second multimeter and calculate a new factor e.g. mutimeter reading / module reading * 2140 = new Calfactor. This new Calfactor is changed in the program and once compiled and programmed it's set for good. No need to adjust a trimmer, they are not very reliable anyway. 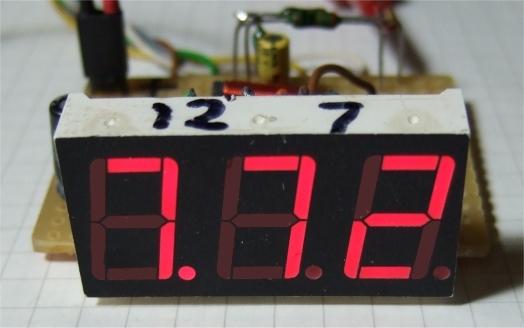 The display shows the voltage difference of channel 0 and 1 when both are connected to 5 V.
There is still a 0.02 V difference visible because the resistors are slightly different. If more accuracy is required two Calfactors could be used in the program. 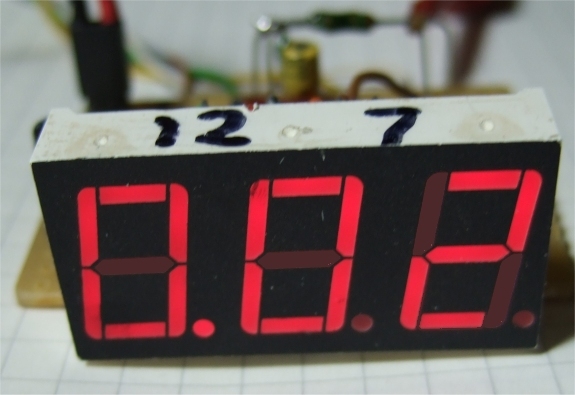 The voltmeter module is autoranging in a simple way, below 10 Volts it shows 2 digits, above the result is divided by 10 and the decimal point is moved. Top view, some resistors are mounted vertically to give more stability and easy connection to the display. The segments are connected to PORTD of the ATMega48 and from there to the nearest pin of the display, the easiest way to build. It results in a somewhat unusual connection like PORTD 7-0 to seg B G C dp D E F A. No problem, software follows hardware and a lookup table in the program makes sure we can display 0 1 2 3 4 5 6 7 8 9 dp F in a correct way. 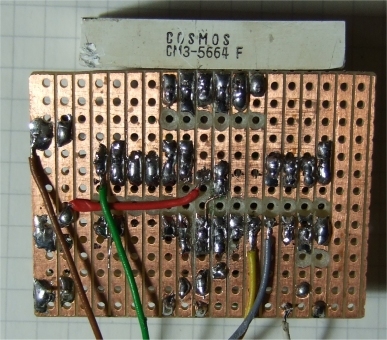 Below is the bottom view of the small board with programming wires still attached. Once the module is calibrated they are disconnected. Many things can be changed in the program to adjust the voltmeter module to your requirements, Dispcnt changes the 100 ms refresh rate. In the interrupt the statement Elseif Icnt = 10 Then ... can adjust the display brightness, a higher value for Icnt will dim the display and reduce power requirements. It needs an external 5 V power supply.und uses about 30 mA at 5V with these settings now. The output PB5 shows which ADC channel is higher: If Adch0 > Adch1 Then... PB5 is low. It could be connected to a led on the frontpanel. 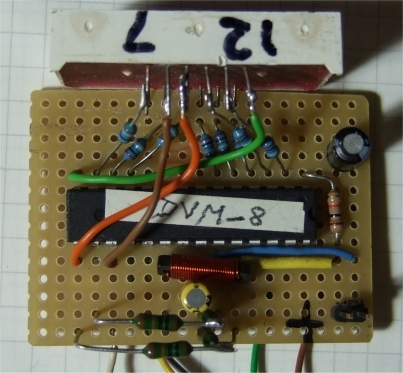 There are different ways to build the voltmeter module as you can see below. I once used this with a synchronous lock-in amplifier for a milliohm meter, but that's another story. Just to mention, that's why there still is a 1 kHz signal on PB2 and on PB4. 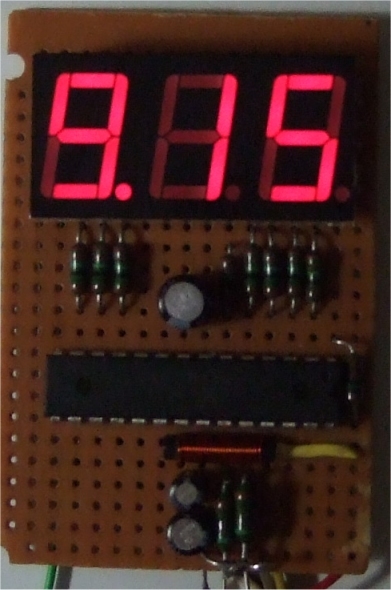 Another layout of the voltmeter module. It' fun to build and to use.